It’s spring — kids, get outside! 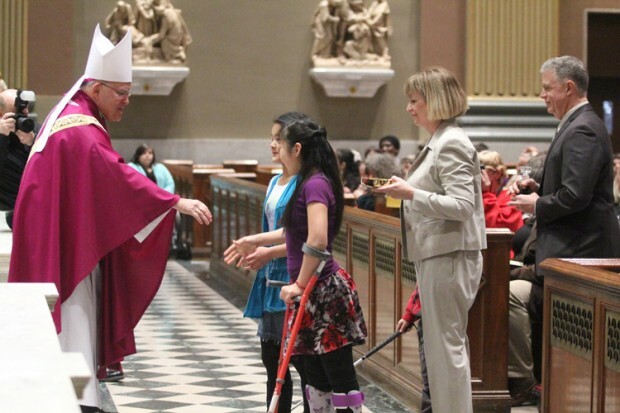 Archbishop Charles Chaput greets Sophie (left) and MaeLeigh Roberto, and their parents MaryAnne and Matt, at the Mass for Persons with Diabilities last March at the Cathedral Basilica of SS. Peter and Paul. Sometimes the Holy Spirit strikes in subtle ways. It isn’t always a dove or dramatic tongues of fire. MaryAnne and Matt Roberto of Our Lady of Fatima Parish in Bensalem, who had three of their adopted children in the offertory procession during Philadelphia’s Disabilities Mass last March in the Cathedral Basilica of SS. Peter and Paul, were not very long ago a fairly typical suburban couple with four birth kids and their share of drama in their lives. 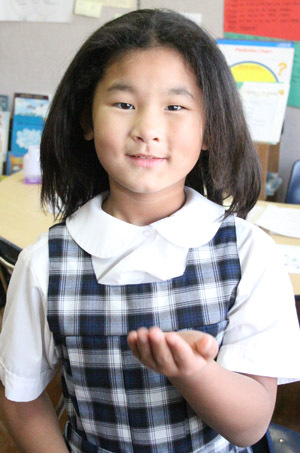 Sophie Roberto, 11, is a student at St. Lucy Day School for Children with Visual Impairments, situated at Holy Innocents School in Philadelphia. 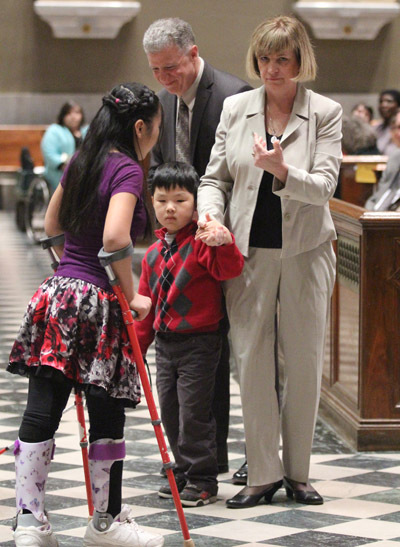 Her adopted brother Vincent, 5, also attends the archdiocesan school of special education. Early in their marriage they had a hard time conceiving a child and had actually started the adoption process with Catholic Social Services. They canceled out when Mick came along followed by Sarah, Meghan and Shannon over the course of seven years. Sure, there were anxious moments, for example 16 years ago when Matt was injured and temporarily lost the use of his right arm. That scared MaryAnne more than anything before or since. Anyway the kids (who are now 23, 21, 19 and 16) were coming along nicely. MaryAnne, who knew from grade school she wanted to work with the blind, was working with blind and visually impaired infants and toddlers at BARC Development Services in Bucks County. Matt, who also had worked with kids with disabilities, had switched to government work. Then a decade ago, when Meghan was sick with an auto-immune disease, she had to take long-term treatments at E.I. DuPont Pediatric Hospital in Delaware. Sometime over the course of treatment she told her parents she thought the family should adopt a child from China. “I don’t know where she got that. The only thing I can think of is one day we might have seen someone pushing an Asian baby in a stroller,” MaryAnne recalls. It didn’t happen immediately because foreign adoptions involve tons of paperwork and expenses, including the trip to China and two weeks at a hotel. During the wait little Sophie, as they named her, was living in China with kindly American foster parents. Because she had absolutely no language skills they sent over pictures and sign language material. They were delighted when they were finally able to bring her home. She looked at them and made the signs for mother and father. That was in 2008. Sophie, who is now 11, received two cochlear implants and is coming along nicely. Once started, the Robertos decided to adopt another child from China whose photo they had seen before Sophie’s adoption went through. This was Shane, a little boy who was born blind and had learning disabilities. One of the prime reasons they adopted Shane was because they knew there was little chance, with his disabilities, that anyone else would feel up to adopting him. Because they both had experience with children with disabilities, it would have to be them. Even so, MaryAnne concedes, Shane’s disabilities proved far more challenging than either of them realized. Vincent Roberto (center), 5, waits to walk back to his pew with is parents MaryAnne and Matt Roberto, and sister MaeLeigh. Another adopted brother, Shane, is not shown. “It took soul searching, yes,” MaryAnne said. “It’s hard to understand this unless you are in the situation. People think it is a choice and technically it is a choice because God would let you say no. You really understand these are your children waiting for you, not someone else’s. When you realize that you do what you have to do. “We never intended to go back to China again because Shane’s needs were so demanding,” she said. Meanwhile, they were looking at MaeLeigh, who was crippled. They knew they just couldn’t afford another adoption, but somehow MaeLeigh’s image came into MaryAnne’s mind every night. Finally, she mentioned it to Matt. “Can we afford it?” he asked. “No,” she replied. “Let’s do it anyway,” Matt said. MaeLeigh was approaching the upper limit in age for adoption in China, and they knew if they didn’t take her then, she would spend the rest of her life in a nursing home; rehabilitative services just do not exist in China. She joined the family a year ago. They had also been looking at another little fellow, Vincent, who is blind. When they picked up MaeLeigh, Vincent gave MaryAnne a big hug, and said, “Hurry back for me, Mama.” Recently they did just that. MaeLeigh, 14, is in an ESL program at Shafer Middle School in Bensalem; Shane, 7, is in an intermediate unit in Bristol. Sophie, 11, is at Archbishop Ryan Academy for the Deaf and Vincent, 5, has started at St. Lucy Day School for Children with Visual Impairments, both situated at Holy Innocents School in Philadelphia. “Vincent couldn’t wait to leave China, and he’s already talking about college,” his mother laughed. As for Sophie, she is also mainstreamed for some subjects at Holy Innocents School and proudly brought home a 100 in math recently. MaryAnne doesn’t pretend any of this is easy. Financially it has been challenging. The money has never been sitting there waiting and it is only through the kindness of friends and even strangers that they have been able of overcome the daunting costs the adoptions entailed. There have also been strains in the family; it is not easy to bring four people with unique needs and challenges into the family unit. Screaming tantrums have been just as much a part of the experience as are the peals of laughter. For most of the children, disabilities may well turn into challenges rather than barriers, but this is a lifetime commitment. 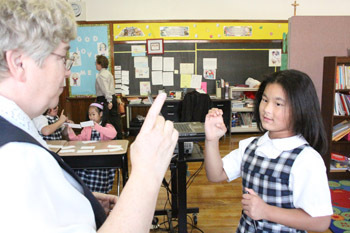 Sophie Roberto practices American Sign Language with the help of a teacher at St. Lucy Day School for Children with Visual Impairments. For the Robertos faith has been a big factor in overcoming the obstacles. In China their new children were not exposed to Christianity, let alone Catholicism. Matt and MaryAnne know full well most people would not have the background needed to put together an amazing family such as theirs, yet there are disabled children in China and other places in the world, who badly need the kind of environment America can provide. There are actually Christian groups active in the field, and MaryAnne only wishes more Catholics would be among them and listen to the call of the Holy Spirit to become involved. “The blessings we have gotten are tremendous,” she said.